Generating a business name is a crucial first step for any business. A bad name can turn off potential customers or clients in a heartbeat, but a great name will have them thinking about you long after they’ve put your business card in their pocket or clicked away from your website. Even freelancers or solopreneurs should take some time to think about what they will call their business. A one-person firm can sound a lot more professional with the right name, and it may help you stand out from the rest of your competition. Creating a business name that both you and your prospective clients are attracted to can be a tough decision—not only will you build a website around that name, but you will also build social media profiles around that name, and once you’ve invested all of the time, money, and effort into building up those various sites, it is hard to back-track and change your business name after you’ve already created it. Every time you change your name, you are starting your marketing efforts over again, and your URL and social media profiles no longer work correctly with the new name you’ve created. When you create a business name, you should be thinking of the impression that will leave on potential clients. What type of business do you want to be? Do you want the name to sound whimsical and creative? Do you want your clients to think your main strength is your reliability? Is there something else you are trying to convey? How you name your business will depend on your personality, what your goals are, and what industry you are working in—a cartoonist can probably get away with a funny name more easily than an accountant can (but hey, with the amount of time I spend talking to my accountant, maybe signaling that you’re an accountant with a sense of humor could actually be a great boon for business). No matter what your business plan is, take some time now to think about a name you’re sure you’ll be happy to have as you grow your business—one that you can imagine sticking with for years or decades, until it becomes a household name for people in your industry and clients who hire people that offer the kinds of services you offer. So you know you want to come up with a great business name, but you don’t have any good ideas…or the ideas you do have seem a little flat. Creating a business name is tough. What you think sounds good might not sound good to anyone else. AND CO is here to help. By plugging in keywords that are relevant to the type of business you run, AND CO will create business name suggestions. 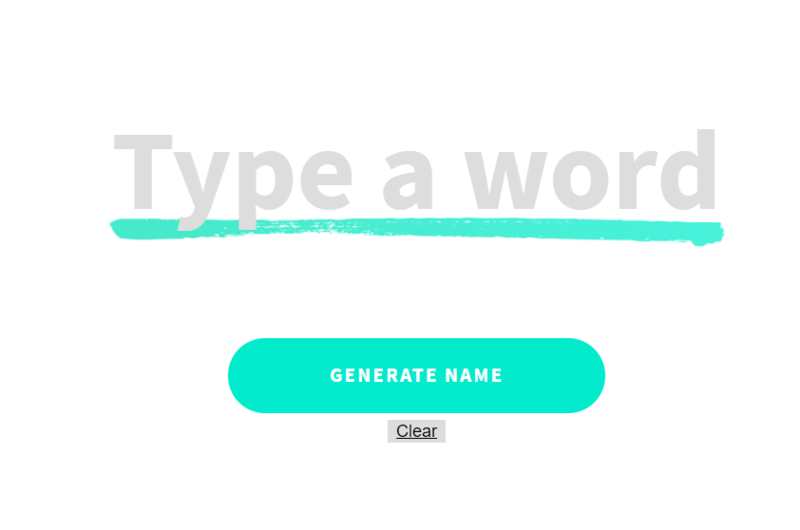 Generating a business name has never been so easy! Sometimes thinking of how to create your own business name can take you away from the actual work of building your business. You might be surprised by generating a business name that immediately strikes you as the one that is perfect for you. Give it a try now!